Going into next season, the Nationals are prepared to start a 32-year-old at first base, a 32-year-old who last season recorded a WAR of literally -1.3. That’s very bad! If Ryan Zimmerman had any dwindling chance of building a Hall-of-Fame career record, he effectively kissed it goodbye. It was an extraordinarily frustrating summer. But is Zimmerman toast now, or what? Spoiler alert: I don’t think so. Story arc: to follow. It’s worth glancing over this thing I just put up about Tyler Naquin. This small post follows directly from the analysis performed for that bigger post. As the season wore on, there were several articles written about how Zimmerman seemed like he was getting unlucky. I have further evidence to support that. 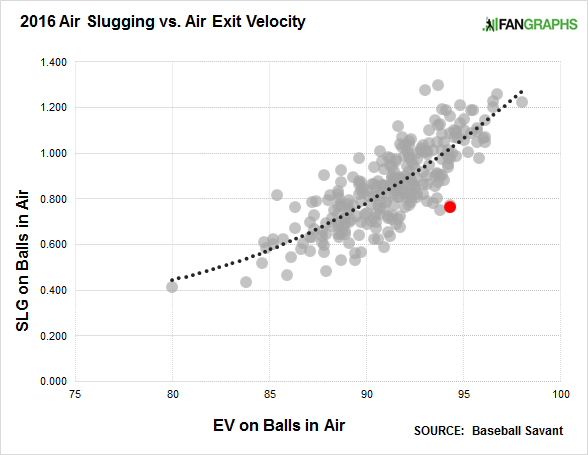 In the linked post, I plotted air slugging against air exit velocity, and I highlighted the Naquin dot. Here’s that again, but with a red highlight for the Zimmerman dot. According to this, Zimmerman under-performed by 262 points. Only Billy Butler came real close to that, and Butler runs like he doesn’t want to wake up a baby. In the earlier Naquin post, I showed that these differences didn’t appear particularly sustainable between 2015 and 2016. And, say, about that! Zimmerman is highlighted here again. In 2015, Zimmerman ranked 31st in average air exit velocity, at 94.5 miles per hour. On those batted balls, he slugged 1.016. 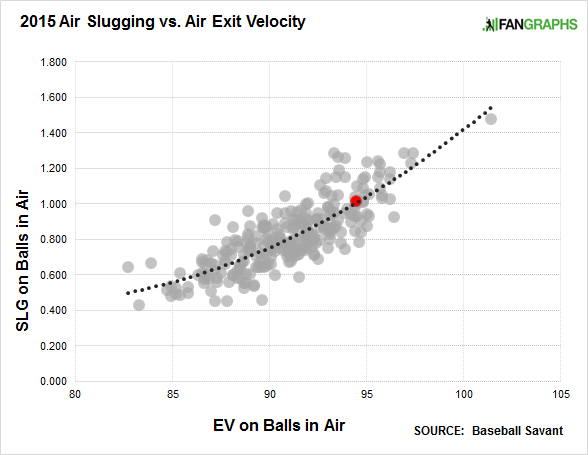 In 2016, he ranked 32nd in average air exit velocity, at 94.3 miles per hour. On those batted balls, he slugged .760. He followed almost exactly standard performance with extreme under-performance, and if you just bump Zimmerman’s 2016 numbers up to the best-fit line, his overall slugging percentage would move from .370 to .460. Instead of slugging like Jordy Mercer, he would’ve slugged like George Springer. You can accept a first baseman who slugs like George Springer. Just for the sake of making sure it’s clear, this isn’t conclusive, because we don’t have a lot of Statcast information yet. We don’t know how all of these things work. Maybe Zimmerman is just weird now. It’s also important to recognize he’s had some injury problems, and he’s coming off a career-low walk rate and a career-high strikeout rate. Ryan Zimmerman is by no means in his career prime. One should rightly assume he’s declining, but from the looks of things, one also shouldn’t exaggerate. Zimmerman is better than the results he just posted. He remains an offensive threat, and a player who further deepens the Nationals’ quality lineup. We hoped you liked reading Was Ryan Zimmerman Actually Bad? by Jeff Sullivan! Still seems like there’s a good chance he’ll provide less than replacement level value in 2017, on a contending team. A team like the Nationals wants to avoid black holes–they should upgrade at 1st base, especially since there are several slugging 1st basemen still available on the Free Agent market. Zimmerman at this point can only play first base. He’s still guaranteed $46M/3 years. If you sign another first basemen you now have the most expensive backup first basemen in baseball. All the signs point to him having been significtly unlucky. It makes way more sense to give him one last shot. If he continues to under preform, then you go into 2018 with a hole at first base and in left field to be filled and that’s about it. Or, as one would hope, he rebounds, puts up maybe ~2 WAR, and you wait another year. The nationals have said a thousand times that they can’t go much higher than $160M in payroll, they can’t afford to have $14-18M on one bench player. Werth will be gone next year, so if Zim doesn’t pan out, you have $21M coming off the books that you can then allocate to first base in some way. It just makes no sense from an organizational standpoint to get another first basemen right now. They still need a closer, maybe another bullpen arm, and quite frankly Norris isn’t that thrilling at catcher. A good fit for the Nationals might be finding a nice infield utility guy, probably a glove first type. If Zimmerman winds up hitting as poorly as such a player, they can move Murphy to first and have a better team defense without changing the offense. It’s why I felt keeping Espinosa made sense.